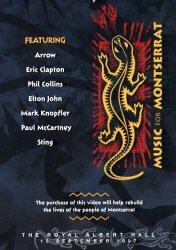 I lately had the opportunity to enjoy this special "Music for Montserrat" event from an open TV channel of Uruguay, the country where I am from, After one year from the original performance date. It has also been transmitted simultaneously in a local FM. Sever years later from that October 3rd, 1990 and after have been watched so many EC shows on video, TV or even DVD, I could proudly say that Eric didn't lost his magical stand, presence and of course musical level which anybody can see clearly in "Music for Montserrat", where Mr. Clapton show to all of us that any flamboyant attitudes are not necessaries at all to reflect the most deepest feelings throughout music, in his case, playing guitar in an unique way, where each note, solo, riff, chord or vocal inflexion run your spine and stay in your heart and soul forever. That's the way I think Eric Clapton is not only a brilliant guitarist or either singer or songwriter, but he's also a real artist who never tries to shine over his fellow artists in those kind of events. ...The simplicity and non-selfishness of a true artist. Congratulations and thank you for all you gave to such a musician as a person.